Wayne Rooney says Manchester United “didn’t create enough chances” in their 3-0 home loss to Manchester City. David Moyes’ side lost a third successive Manchester league derby since 1970 and their sixth home loss in the ongoing campaign- more than they managed in the three previous campaigns put together. “It’s not good enough. You can’t lose six home games in a season. 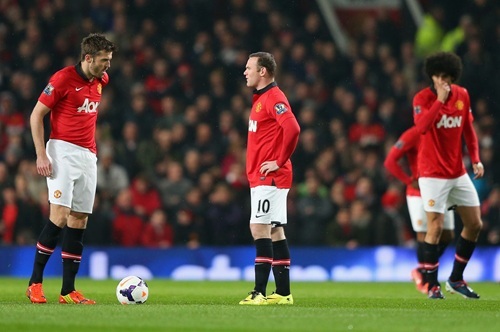 We need to put that right, and make this a place which teams fear again.” Rooney told MUTV after the match. The visitors hit the Old Trafford ground running with an Eden Dzeko strike withing 48 seconds of kick-off and the Bosnian doubled their lead with four minutes left to the hour mark. Ivoirian Yaya Toure sealed another deserved win for the Etihad stadium outfit on the nick of full-time- his 21st strike in all competition- as City reduced the gap between them an leaders Chelsea to just three with two outstanding games. Wayne Rooney Says United Must Restore Confidence This Weekend Ahead of Their Champions League Tie Against Bayern Munich. “No-one likes to lose a derby game – they’re big games and they’re great to win, but when you lose it’s not a great feeling. For the fans and for us, we have to win more and stay together,” he continued. Rooney says it is imperative to get all three point against Aston Villa this weekend to boost the club’s confidence ahead of their crucial Champions League last-8 tie against Bayern Munich next week. “We’ve got two big games coming up against Bayern Munich but first we have to focus on the Villa game and try to end the season on a positive note,” said Rooney, 28. The ongoing campaign has stretched the faith of majority of the ‘Red Devil’ fans, whose loyalties have been under fire on most occasions, yet they remained faithful in front of their ‘noisy neighbours’ on Sunday. Rooney added: “They were great again tonight. As a team, we need them to be strong and to understand there has been a big change at the club. Dolphins Embark on a Third Strike Over Non Payment of Wages. THE NIGERIAN IMMIGRATION SERVICE RECRUITMENT. FOR ASSISTANCE AND PLACEMENT CALL 09034389104. THIS IS FOR APPLICANTS ONLY.